The quality of the light and the issue of drawing the substance of the paintings from my own, everyday surroundings -- contemporary California, middle-class surroundings -- is basically what the paintings have been about all along... It is still a challenge to use these materials in a way that is formally interesting and at the same time evokes some kind of poetry. Image size: 8¾ x 11¾"; paper size: 17½ x 20". Image size: 7¾ x 11¾"; paper size: 16½ x 19¾. Image size: 7¾ x 11¾"; paper size: 16½ x 19¾". Image size: 21½ x 31"; paper size: 30½ x 39". Edition 40. Color direct gravure with spit bite aquatint. Image size: 16 x 24¾"; paper size: 24¼ x 32¼". Edition 15. Image size: 17¾ x 24¾"; paper size: 26 x 32¼". Edition 25. Image size: 22 x 30¾"; paper size: 31 x 39". Edition 30. Image size: 8 x 16"; paper size: 16 x 23:. Edition 30. Image size: 6 x 16"; paper size: 16 x 23". Edition 30. Color direct gravure with spit bite aquatint and soft ground etching. Image size: 9 x 12"; paper size: 16¾ x 20". Edition 40. Image size: 8 x 16"; paper size: 16 x 23". Edition 40. Image size: 6 x 12"; paper size: 13¾ x 19". Edition 40. Image size: 8 x 13"; paper size: 16 x 20". Edition 50. Image size: 9 x 12⅝"; paper size: 19½ x 23¾". Edition 25. Image size: 12 x 15¾"; paper size: 22¾ x 27¼". Image size: 12 x 15¾"; paper size: 22¾ x 27¼. Image size: 7½ x 11"; paper size: 18¾ x 21". Image size: 9 x 12"; paper size: 17¾ x 18". Image size: 4½ x 6"; paper size: 17 x 14¼". Image size: 7½ x 11½"; paper size: 19¼ x 23½". Image size: 12 x 14"; paper size: 20¼ x 24½". Image size: 11½ x 13½"; paper size: 21 x 24½". Image size: 10 x 14¼"; paper size: 20½ x 25½". Color woodblock printed on silk mounted on rag paper. Image size: 10 X 15"; paper size: 26 x 26¼". Edition 50. Published by Crown Point Press and printed by Zhi Jin Gu with Zhu Di Wang at Tao Hua Wu Studio, Suzhou, China. Color woodcut printed on silk mounted on paper. Image size: 11 x 16"; paper size: 27 x 26¼". Edition 38. Published by Crown Point Press and printed by Sun Shumei, Rong Bao Zhai studio, Beijing, China. Image size: 7 x 9¾"; paper size: 21¼ x 21¼". Edition 15. Image size: 24 x 28"; paper size: 30¾ x 34¼". Edition 50. Color soft ground etching in three panels on one sheet of paper. Image size: 22 x 49¾"; paper size: 32¼ x 59¾". Edition 35. Image size: 16 x 24"; paper size: 22½ x 30". Edition 50. Image size: 7½ x 9"; paper size: 14¼ x 15". Edition 25. Image size: 7½ x 9"; paper size: 14½ x 15". Edition 25. Image size: 8 x 7"; paper size: 14¾ x 13". Edition 25. Image size: 4¼ x 5"; paper size: 11¼ x 11¼". Edition 25. Bechtle began drawing and painting at a young age and won a scholarship that paid for his first year of college by submitting a portfolio of artwork to a national competition. After graduating from the California College of Arts and Crafts (now the California College of the Arts) in Oakland, he was drafted into the U.S. Army and sent to Berlin where he painted murals in the mess hall and delighted in visiting European museums. Back in California, he got an MA from the California College of Arts and Crafts and began his teaching career there. Over the years he has taught in various Bay Area institutions, especially San Francisco State University. 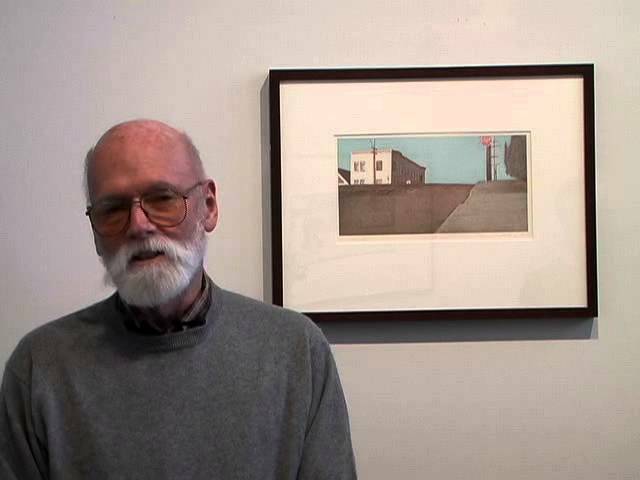 Besides making paintings, watercolors, and drawings, he is an accomplished printmaker: he worked in lithography early in his career and mainly in etching after 1982 when Crown Point Press began publishing his prints. Bechtle was given his first solo museum exhibition in 1967 by the San Francisco Museum of Art (now the San Francisco Museum of Modern Art), and in 1970 the Whitney Museum of American Art in New York purchased a painting of his. Since then, his work has been acquired by the Museum of Modern Art and the Guggenheim Museum in New York, the Smithsonian Institution in Washington, DC, and other museums in the United States, France, and Germany. Bechtle had his first New York exhibition in 1971 at OK Harris Works of Art, where he continued to show regularly until he joined the Barbara Gladstone Gallery in 2003. He is also represented by Anglim Gilbert Gallery, San Francisco. 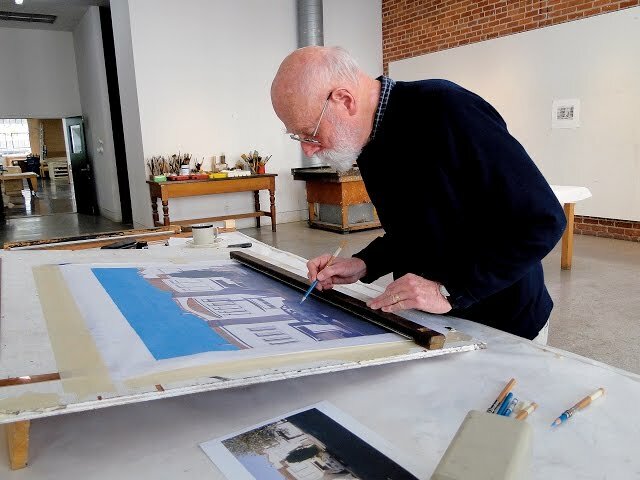 Artist Robert Bechtle working at Crown Point Press in San Francisco to create a color soft ground etching with aquatint, 2011. Painter Robert Bechtle discusses making prints at Crown Point Press in San Francisco, 2007.